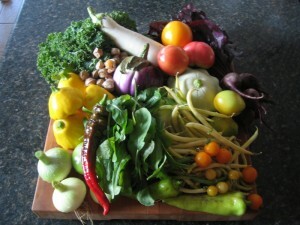 I’m new to the “locavore” movement, or trying to eat only locally produced food. My wife saw a sign up for a new CSA from an organic farm this spring and the items at their stall at out local farmers market always looked good so we signed up. Most CSA’s operate this way: you sign up for a full share or a half share and receive a box of produce every week for the growing season (sixteen weeks in our case). We were told a full share would feed two people and a half share one person so we paid $350 for a full share. Each week we get a box with enough vegetables for three to four people, as you can see above. The farm we signed with doesn’t grow any fruit so it’s all vegetables, and with this very wet summer we’re had an abundance of summer squash and zuchinni. It’s been a great experience and has opened our eyes to what’s out there, plus forced us to each new vegetables we always skipped over in the supermarket. We’ve been debating about trying a different farm next year to get a different mix.